We need more US Presidents who are unashamedly adventurers and big game hunters. Somewhere along the way in the passage of time the art of the adventurer has all but vanished, particularly for those who aspire to high office. That Teddy Roosevelt was one of America’s greatest presidents is beyond doubt, His image is carved into Mount Rushmore along with George Washington, Thomas Jefferson, and Abraham Lincoln. A US President needs to be a “larger than life” person. Teddy Roosevelt was surely larger than life. Teddy Roosevelt was willing to take on the danger that comes with adventure. His all American 405 Winchester was his preferred rifle. 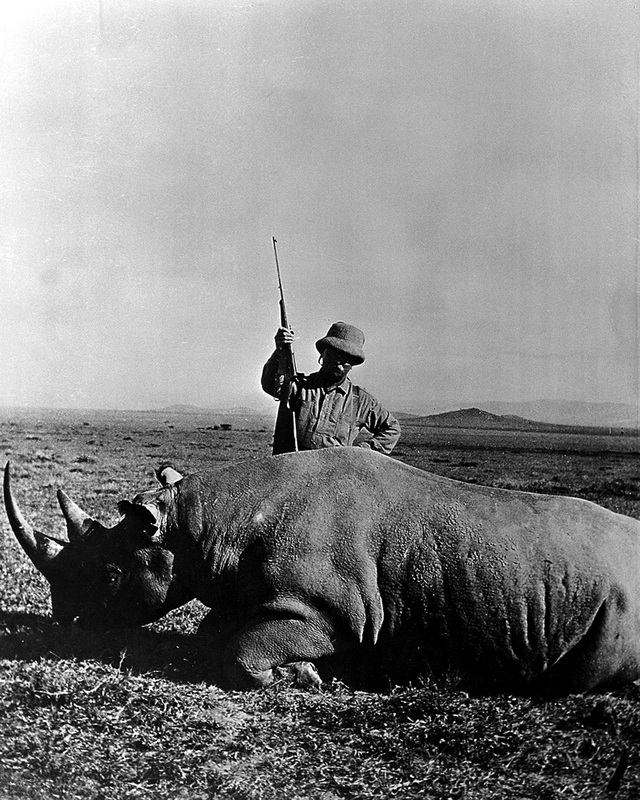 Teddy Roosevelt, like most hunters, was avidly interested in wild places, wild life and their conservation so that they would be enjoyed and treasured by future generations of Americans. He served as US President from 1901-1909 and when he reluctantly left office he was presented with the beautiful hunting knife in the pictures in this post by his long term friend New York Supreme Court Justice James W. Gerard before Roosevelt headed off for his famous African Safari. From the looks of the knife it has been carefully used and well looked after, having the patina of a knife that has seen good use and has a few stories to tell. The blade was created by J. Russell and Co. of Green River, New York as can be seen in the picture above by the stamp at the tang. The handle, which is made of gold and platinum was created by prestige jewelry company Dreicer & Co. whose inscription appears on the handle’s edge. This knife is a tangible physical link with a man who was instrumental in shaping the United States as a great nation, as great statesmen do when put in positions from which they can serve effectively with all their heart. Teddy Roosevelt gave his all for the country and people he loved. This knife is a memorial to the things he treasured, the State Seal of the nation’s elected servant, her people, her wild places and her wildlife. This national treasure is to be sold by Rock Island Auction over September 9 – 11, 2016. You will find the sale page with more information if you click here. This is an artefact of such significance that we hope it will go to a new home where it will be displayed for the American public to enjoy, and to remember one of America’s most valued servants, and the service he did for his nation and her people.